Visiting zoos and theme parks is always fun but the long waiting times at roller coaster, food zones, information counter, ticket counter are the biggest obstacles visitors face while visiting zoos and amusement parks especially weekends and holiday season. Moreover, teachers and parents are unable to enjoy their visit as they have to keep a constant eye on the kids in the large grounds which is a dreadful task. But all thanks to Bluetooth Low Energy (BLE) technology. BLE enabled proximity beacons lets zoos and theme parks offer their visitors a more seamless and personalized experience. A beacon app for zoos and theme parks enhances visitor’s experience by greeting them when they enter the zoo. During their whole visit, the app keeps interacting with them either by giving information or helping to locate the new rides. It offers many benefits that you may have never thought of. Generally, theme parks cover large area of land and feature various attractions such as rides, games and much more. In such places, visitors may get baffled about the areas to explore and may get lost easily. If beacons are deployed. The beacon app for zoos and theme parks can help visitors in way-finding and indoor navigation with the estimated walking time. With the help of a map, visitors can locate the attractions and can opt for rides or can plan to visit various sections as per their choice. As and when the visitors enter a new section, push notifications can be triggered like “You’re here” to keep them informed. Most of the theme parks and zoos are equipped with kiosks and interactive displays so that visitors are aware of hips and happenings inside the zoos. Although Kiosk and Interactive displays serve as an interactive platform and provide every bit of information about animals and rides; it is very much expensive to maintain and also make people wait in line for interaction. By deploying beacons, visitors can receive every bit of information about animal’s habitat and other details of each species on their mobile phones through the beacon app for zoos and theme parks via push notifications when visitors are in proximity to that section. There are the chances that visitors may forget about the information they have seen via kiosk after leaving the place but with beacons, information is right on their hands. Finding parking space in zoo and theme park especially on weekend is a challenging task. One has to drive back and forth to check the available space and this consumes much of the time. Smart parking solution can be a savior! If beacons are deployed and visitors have the beacon app installed, they will immediately know empty parking slots and can also pay the parking charge via the app; this helps them to save time for booking new parking space and do not have to wait in queue to pay the parking charge. Once the car is parked, the beacon will save the location of the car and will send push notification about the location of the car once visitors are back from the park. Although, visitors are enjoying their visit to theme parks but to add more fun during the visit, you can take help from the beacons. In order to increase engagement and make visitor’s visit memorable, you can engage your visitors in treasure hunt games. With beacons, you can send the hints on their smart phone and ask them to find treasures; if they’re successful, you can offer them a discount coupon, free merchandise etc. This will enhance the visitor experience. Managing kids at the zoo and theme park is one of the challenging tasks for teachers and parents both. Theme parks and Zoo management can offer on-rent wearable device which would help parents to keep track of their kids while also enjoying their visit. The beacon will set the range for the kids, once they cross the threshold limit, parents/teachers will get the alerts about them on their mobile phones. This will help parents/teachers to relocate their kids from their current location. With Beacons, the authority can analyze the data of every visitor and accordingly can improve their user experience. The data collected through beacon help them in identifying the busiest hours in a day, which section of the day was mostly occupied, which rides attracted the visitors the most, who claimed for the offer and much more. This helps the managers to plan well in advance, improve their efficiency and can offer services in a better way. Vulcania, an educational amusement park located in France, have deployed beacons to provide a great user experience. It offers fun and interactive journey and helps their visitors to explore the power of volcanoes and other things about nature. They have a beacon based mobile app that helps in indoor navigation and send notifications based on the location. Vulcania app improves the visitor’s flow by rearranging the list of attractions and encouraging them to visit the other sections which are closest to the user’s location. Deploying beacons in zoos and theme parks not only help to enhance visitor experience but also helps in improving services and facilities. Beacons target the right customer at a right time and help zoos and theme parks to generate more revenue. BLE Mobile Apps is a leading beacon based mobile app Development Company that can offer you a bespoke and full-fledged mobile app solution that can help zoos and amusement parks with automatic ticketing, parking, navigation, real-time push notification and much more. 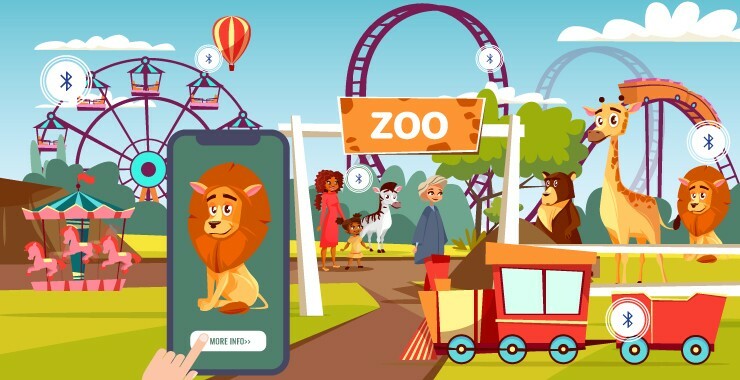 Experts at BLE Mobile Apps are well-versed with the technology can provide user-friendly beacon apps that can streamline zoo/theme park operations. Looking to develop beacon app for zoos and theme parks? Let’s connect.